This past Saturday, February 6th, there was an anarchist event in Riverside titled "Anarchy in Riverside". It was held in the basement of Back to the Grind in downtown Riverside & organized into two parts. The first part, the meeting/conference portion of the event, was scheduled to be from 12 PM to 5 PM & the fun/entertainment portion to be from 7 PM - 10 PM. During the meeting portion, the Inland Empire Feminist Collective, Modesto Anarcho, & Dana Ward were to hold workshops & at the end there was to be a round-table discussion on "what to do next" in Riverside. During the entertainment portion, the notorious homeless jug band from Santa Cruz, Blackbird Raum, was to play as well as Corona legends, Acoustic Destroyer & some other musicians. I arrived halfway into the workshops, catching the tail end of Modesto Anarcho & staying for Dana Ward's lecture & the roundtable discussion. While Dana Ward was preparing to speak, I remember thinking the lecture was going to be exhausting & heavily academic, but to my surprise when he began his talk on anarchist infrastructure & worker cooperatives, I warmed up to him & thoroughly enjoyed his lecture. His lecture was not only thorough in his explanation of the history of anarchist theory on infrastructure, but he was able to drop big name anarchists in a way that was tangible & easy to understand. He also comprehensively explained anarchist & non-anarchist worker cooperatives while keeping the attention span of the room. Towards the end of the lecture, a debate broke out between a member of Modesto Anarcho & Dana Ward. The issue seemed to be that a member of Modesto Anarcho was concerned that anarchist worker cooperatives would create a "self-managed prison" & Dana Ward argued against that concern, claiming that wouldn't occur given everyone involved in the business would decide what happens and create an entirely different concept of what a business is. (For analysis from the Modesto Anarcho member's perspective & the ensuing debate in the comments section see: Vengeance) The ironic ending of the debate was, because of what I perceive as the Modesto Anarcho member's lack of clarity in his concern, that Dana Ward ended up questioning the class of his debater in a way that pondered whether he was from a middle class background and arguing against work itself. For those not in the know, Modesto Anarcho unabashedly represents themselves as a working class anarchist crew. After a short break, a somewhat awkward round-table discussion was initiated in which it seemed that the facilitator of the discussion was unprepared to guide the discussion. Due to the lack of direction, the discussion never took off as participants vaguely talked about doing projects or combating local struggles. Perhaps the outcome was partly due to the lack of facilitation & direction with the discussion & also because it appeared many of the participants were strangers or acquaintances to each other. Either way it was an awkward solemn discussion. 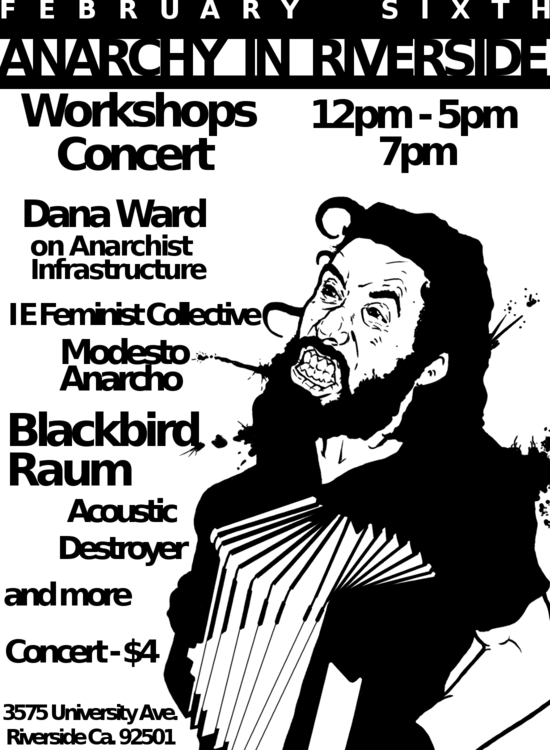 Though the show was planned to be at Back to the Grind, Riverside police shut down the show on the basis that the image on the flier of the accordion player from Blackbird Raum was sacrilegious in relation to Jesus. The show was moved to a house down the street from Back to the Grind & though I didn't attend the show, a friend who did reported that the show was fun but disappointing. Disappointing because the majority of the crowd didn't attend the conference portion & appeared to be of that social clique merely following the trends of punk rock through the years without seriously involving themselves in the movement. Go figure. Overall the event was alright. At the event I heard talk of building off this event & having continual local Riverside County anarchist events & I hope that does happen. If so, in hindsight this event will have been a nice start to build momentum but if not, then a depressing example of an anarchist movement never begun. We need continuous monthly or periodic anarchist serious & fun social events so that we can help build the movement. It is essential we find each other & create tight affinities so we can struggle together at school, in the workplace, & in the streets. Alienated, alone & compromising our beliefs & actions amongst people who don't & may never share our beliefs will get us nowhere. "All friendship is political".